This is a very simple jig, it has a base and two fences. The bolts allow fine tuning of the centerline and also hold the neck blank in place. Watch the video to see all the details. T-nuts to hold the bolts on the truss rod channel routing jig. 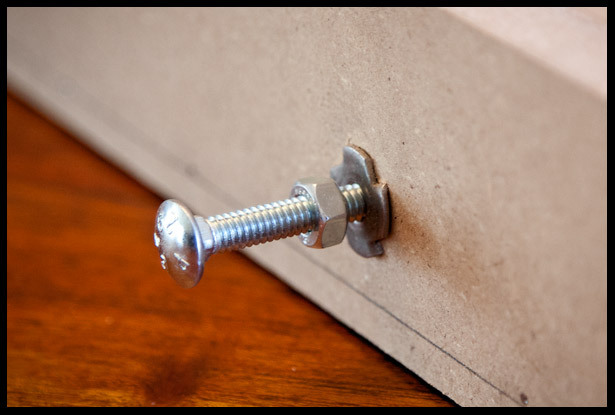 Once the position of the neck is set with the bolts, the nut can be tightened to prevent the bolt from turning. Wouldn’t you locate your t-nuts INSIDE of the channel, so the force exerted by the positioning bolts doesn’t unseat them? Granted, you’re likely not to tighten them to that point, but in theory the t-nuts want to press INto the sides of the channel, rather than out of it. Also, this design requires you to manually position the router handles perfectly perpendicular to the centerline you’ve drawn. If one hand moves forward even a tiny bit, the router is cutting a radius rather than a straight line. This is something I will have to address in my design. I like this design and will build my own. Thank you. My jigs are in constant evolution, always improving. Your t-nut ‘inside’ the channel is a great idea, although it won’t have any practical benefits since there is very little force applied… it is however a better design solution. I will incorporate that idea into the next version, thanks. Yes, the router needs to be perfectly positioned inside the channel and not rotate while routing. I don’t have any ideas on how to solve this, but practically speaking, I’ve routed a few truss rod channels with this jig and they all look great. Let me know if you solve this design problem. 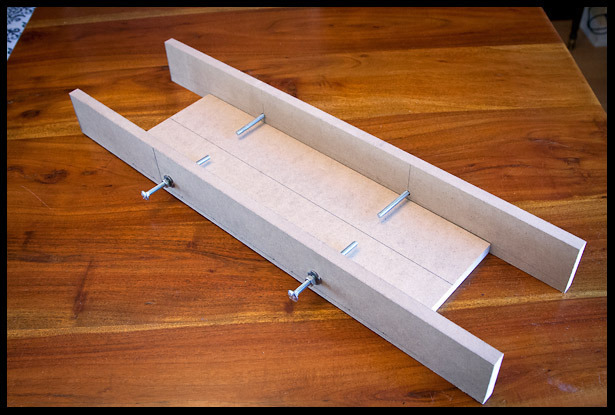 Araz, when I had one of these jigs I attached a rectangle-shaped piece of 12mm plywood to the router base. It was -almost- the same width as the base so it was easy to keep it aligned and it didn’t bind when I moved it. That will obviously prevent the router from rotating. Thanks for the idea Dave. Although I don’t have an issue with “rotating router”, this is indeed a good idea and an improvement on the jig. Thanks again! hey, regarding the router orientation problem, you could make a plywood mounting plate for it that would be true and square and wich would ride on the side pieces. I’ve used a jig that had the base and sides of yours (no bolts, but double sided tape was used to fasten the neck), which may offer a solution to the possibility of rotation. A square piece of wood that is just slightly wider than your wood structure (width, plus thickness of sides) was screwed to the router. This piece had two sides that may have been about 1.5 inches deep, allowing the router to slide along the base without tilting and always parallel to the base. This process is easiest if you do it… before you shape the neck… and using a fence/router table. You don’t apply the veneer to the headstock until the truss rod channel is done, bc then you can hide the mess you made… if there is one. This is a great video… and instructional. You’re talented. Thanks for the effort. There’s another video on the subject by Fletcher Handcrafted and he demonstrates what I mean… using a pencil line on painter’s tape as a stop guide – since the work piece is upside down. I feel spoiled often by my pin router. The thing that really changes the game for me has been my shopsmith’s pin router. The newer models come with them – mine is the discontinued model… but it makes my router work incredibly more precise.